Dance Theater Presentation by SINAGBAYAN. Poster Design by Jennifer Padilla with Pitong Sundang icon by Boy Dominguez. 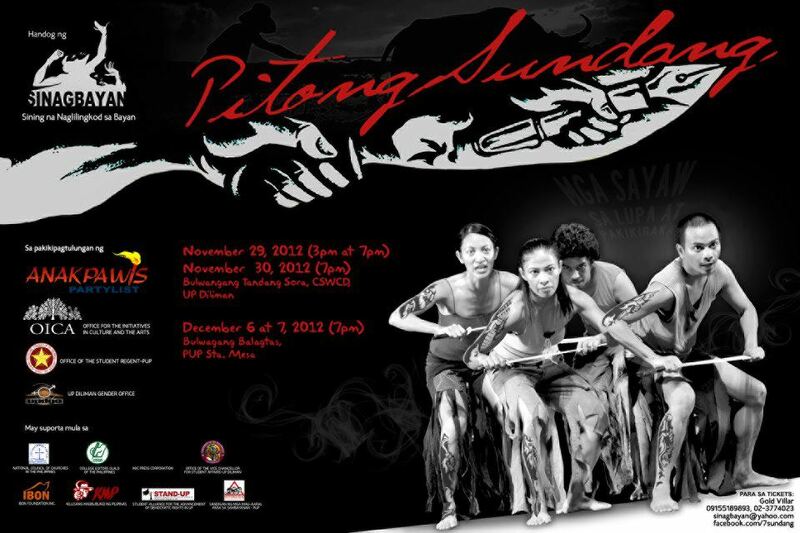 In commemoration of Andres Bonifacio’s heroism and legacy in the fight for national freedom and democracy, SINAGBAYAN (Sining na Naglilingkod sa Bayan / Art for the People) in collaboration with Anakpawis Partylist presents “Pitong Sundang: Mga Sayaw sa Lupa at Pakikibaka” (Seven Bolos: A Dance Theater Show on Philippine Struggle for Land). It features dance interpretations of poems by political prisoners Ericson Acosta and Alan Jazmines as well as a poem by Prof. Reuel Molina Aguila. Limited Seats. To reserve tickets, contact Gold at 09155189893. This entry was posted in Teatro and tagged Alan Jazmines, Anakpawis, Andres Bonifacio, Bayan Muna, Boy Dominguez, dance theater Philippines, Ericson Acosta, GARB, Ibon Foundation, Katsch Catoy, KMP, lupa at pakikibaka, Philippines, pitong sundang, SINAGBAYAN, struggle for land, Talahib. Bookmark the permalink.